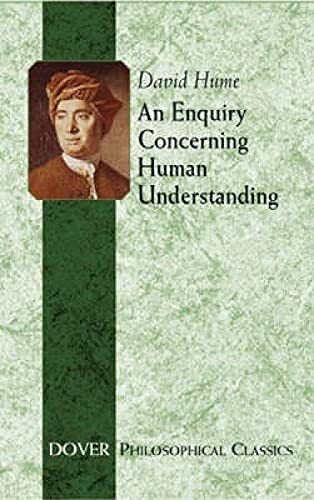 One of philosophy's most widely read books and the best introduction to Hume's other works, this 1748 treatise offers an accessible account of the author's provocative notions about the limitations of the mind. Topics include the logical coexistence of free will and determinism and the deficiencies of religious doctrine. DAVID HUME was born in Edinburgh, Scotland, on April 26, 1711. He entered the University of Edinburgh at the age of twelve but left a few years later without having been conferred a degree. Being a lifelong skeptic, Hume was taken with the French philosophers whose work was exemplary of the movement. In 1734, he made an intellec-tual pilgrimage to La Fleche, France, the town where Descartes had been educated. Three years later, this change of scene culminated in his book titled A Treatise of Human Nature. After returning to England in 1737, the remainder of Hume's life was spent writing on psychology, morality, and politics. During this time, his bid for appointment as professor of ethics in Edinburgh proved unsuccessful because of his views on religion. From that point on, he was to undertake short-term positions of employment with powerful and influential people in the English government. These appointments included some travel to the Continent. From 1767 to 1768 he served as undersecretary of state for the northern depart-ment. Hume then returned to Edinburgh, where he died eight years later on August 25, 1776. David Hume's works include: A Treatise of Human Nature (1739), Treatise--Of the Understanding (1739), Of the Passions (1740), An Abstract of a Treatise of Human Nature (1740), Essays Moral and Political (1741-1742), An Enquiry Concerning Human Understand-ing (1758), An Enquiry Concerning the Principles of Morals (1751), Political Discourses (1751), History of England (1754-1762), Four Dissertations (1757), and Dialogues Concerning Natural Religion (published posthumously in 1779).